At midnight on April 9, 2012, the Maryland General Assembly ended its 2012 session – without enacting an apparent compromise that would have balanced the budget through both spending cuts and revenue increases. This means that the so-called “Doomsday Budget,” which is balanced through deep cuts in expenditures, will go into effect on July 1, unless a special session of the General Assembly is convened to try again. A Special Session is a virtual certainty, but as of this writing, when it will convene and whether it will be confined to just budget issues is still up in the air. SB 108 (making clarifying changes to the stable license law) and HB 680 (requiring the state to incorporate education about sustainable ag into science curricula) passed both houses of the General Assembly. In addition, Sunday hunting bills in Dorchester and Caroline (SB 105/HB 114 & SB 390/HB 129), Harford (SB 346/HB 321), Cecil(HB 877), and Calvert, Charles and St. Mary’s counties(HB 1431) passed. Only the PG County bill (HB 809) failed to move. On the racing side, SB 49 (making certain changes to the Maryland-Bred Race Fund) and SB 794/HB947 (eliminating the restriction on the use of Purse Dedication Account funds for operating expenses at Ocean Downs and Rosecroft through 2015) were passed by both houses. Bills that failed to emerge successfully include HB 912 (changing “owner” to “guardian” in certain laws applying to dogs); SB 445/HB 336 and SB 203/HB 484 (giving courts the power to order transfer of ownership of confiscated animals, and requiring original owners to pay costs in removing and caring for confiscated animals after conviction of certain crimes of abuse, neglect or cruelty; HB 376 (redirecting slots revenue away from racing industry and to school construction); SB 15 (requiring a study of the mission and operations of the Show Place Arena at the PG Equestrian Center); SB 301/HB 1020 (establishment of a registry of convicted animal abusers). A number of changes to the Maryland Agricultural Land Preservation program (MALPF) – SB 129 (easements), SB 148 (lot releases), SB 112 (appraisals) were enacted. A number of bills related to manure management regulations and the Chesapeake Bay watershed restoration were unsuccessful: SB 330 (prohibited new regulations to mandate action on farms until other watershed states equal Maryland’s performance so far); SB 594 (prohibiting winter application of animal manure and biosolids); SB 822/HB 487 (prohibiting watershed implementation mandates on local jurisdictions unless funding from state or federal sources would support); SB 823/ HB 486 (requiring the state to develop and rank a list of best management practices for watershed implementation). However, SB 118 (allowing the state to add sediment to its existing nutrient credit program) passed both houses. Of general interest: the Governor’s Sustainable Growth and Agricultural Preservation Act (SB 236/HB 445) (related to the implementation of PlanMaryland) was enacted with amendments that leave final control in the hands of the local jurisdictions. The Family Farm Preservation Act of 2012 (SB 294/HB 444) was also enacted. This exempts up to $5 million dollars of the value of a farm from the state estate tax when it will remain in agricultural use for at least 10 years. It also reduces the rate for property exceeding $5 million from the current 16% to 5%. The “Flush Tax” was doubled from $30 to $60, but only for users who discharge into the Chesapeake Bay Watershed. But the proposed increase in the Gas Tax (SB 971/ HB 1302) failed. Finally, a few bills of interest that were filed late: HB 1303 (which doubles from $100,000 to $200,000 per practice the maximum amount of state cost sharing for water pollution control projects such as manure storage structures, steam fencing and crossings, etc.) passed both houses. This will be especially helpful as farmers are asked to install more “best management practices” to meet Watershed Implementation Plan goals. HB 1404 was enacted, moving the Animal Waste Technology Fund from the Dept. of Business and Economic Development to the Dept. of Agriculture. This fund is intended to research, develop and market projects to reduce the amount of nutrients in animal waste, or develop alternative waste management strategies. Unfortunately, SB 976/HB 1309, which would have expanded the list of tax deductible equipment purchases under the subtraction modification law to include manure spreaders and other nutrient application equipment failed to pass. To read bills in full, visit the website for the Maryland General Assembly and enter the bill number in the appropriate field. 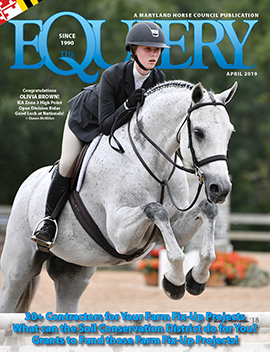 Final week to check out the April Equiery classifieds! NextIs Anne Arundel hostile to Ag? Are Montgomery County Parks Being Threatened?